“Live it, protect it, explore it.” Cal Poly’s Recreation, Parks and Tourism Administration major is founded upon that motto. 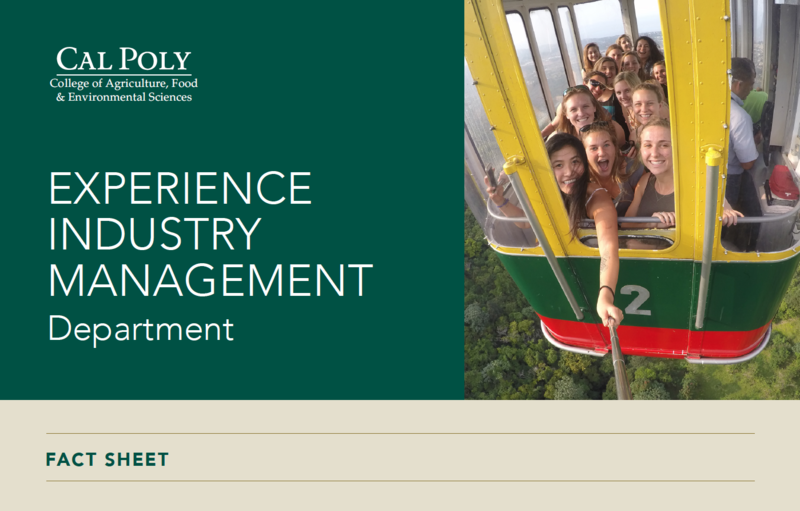 Through our program, EIM students gain expertise in a wide range of exciting areas, including Community Services Management, Event Planning, Outdoor, Adventure and Resource Recreation, Sport Management, and Tourism Planning and Management. Our curriculum focuses on the development of students’ appreciation, knowledge, understanding, and skills in leadership, planning, and administration of park, recreation and tourism programs and services. Upon graduation, our students go on to launch careers at some of the industry’s most compelling companies, like the San Francisco Giants, Pebble Beach Resorts, the U.S. Forest Service and Costa Azul Adventure Resort. Our major is comprised of approximately 300 students, each of whom completes a minimum of 1,000 hours of related paid and/or voluntary work experience as part of their education. This hands-on experience makes our graduates industry-ready when it comes time start a career. As a young student hoping to pursue a career in sports, I have learned so much, not only in class, but through a valuable internship with NASCAR that was made possible through this major.